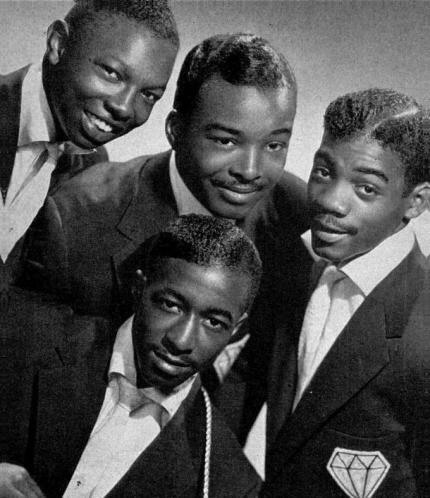 Long before the "Little Darlin'" Diamonds of Canada emerged on the music scene there was a New York City R & B group that had one of the most beautiful harmonystyles around. 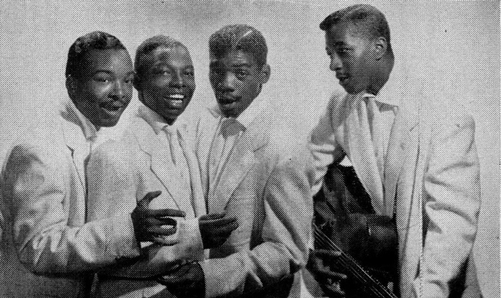 The group began as a trio from Harlem labeling themselves theThree Aces in 1948. Harold (Sonny) Wright on lead, first tenor Myles Hardy, andbass, Daniel Stevens. They became the Four Aces in 1951 when Ernest Ford joined, since Eight Aces already existed and a white quartet of Aces were emerging these Aces changedsuits to the Four Diamonds and later to just The Diamonds. In 1952 Sonny went solo at the Apollo amateur night contest and won. After several more wins owner Bobby Schiffman offered him a week on the bill. Sonny told him about the group and Schiffman ran them thru an audition. He was so impressed he gave them a weeks worth of work and took them on for management. 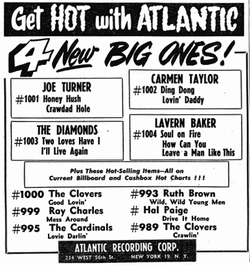 Their first recordings were on October 29, 1952 & "A Beggar for Your Kisses" became there first single in December. "A Beggar" even though it had exquisite harmony went begging for air play. Their next single, "Two Loves Have I" was a gorgeous ballad derived from a French melody, with Sonny singing his heart out and Myles's constant falsetto nearly establishing a trademark sound for the group. Seems like no one at Atlantic was paying attention what with the Clovers having great success with "Middle of the Night". Their last single was "Romance In the Dark" b/w "Cherry" the latter an outstanding side that deserved a better fate. 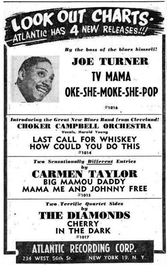 They broke up in 1955 but not before they wowed audiences in Philadelphia's Town hall on June 17, 1955 along side Dean Barlow, The Crickets, Ruth Brown The Dreams, Bo Diddley, and Screamin' Jay Hawkins. (1)http://www.vocalgroupharmony.com/IllLive.htm (2)American singing groups book.